BOSTON – How best to entertain an audience? Elementary, my dear theater-goer. Take some timeless characters, add some dazzling production values, and supply a plot with more twists and turns than a cheap garden hose. Charles Marowitz’s tale hews fairly closely to most of the familiar aspects of the legendary detectives and is delightful fun, no heavy lifting. Here, Rufus Collins’s Sherlock is a detective who doesn’t stray very far from a familiar template but Marowitz has taken the liberties of exaggerating some of his less admirable qualities in the interests of upping the comic elements of the piece. He’s very much in love with his own voice, and often imperious, haughty, condescending, impatient and callous – in short, not a very appealing person at all, save for his superior intellect and deductive powers and a dry wit, albeit one that is often laced with cruelty. He treats the devoted housekeeper Mrs. Hudson (practically perfect Jane Ridley) as a shabby underling and doubts she needs time off to care for an ill relative. He does come equipped with his familiar accouterments: dressing gown, pipe, deerstalker hat and violin, with Fabio Toblini’s spot-on costume design. Dr. John Watson (Mark Zeisler), Holmes’ aide-de-camp and chronicler of his exploits,.is stolid and unflappable, even though he is often the target of Holmes’ slings and arrows, which for many years he has taken with good humor. He has stayed close to his friend’s side through a string of breathless adventures, and now the two are gearing up for what may be the famed detective’s last case. The son is apparently seeking revenge for the death of his father, who perished as he fought with Holmes atop Reichenbach Falls. Soon, a fetching young woman named Liza (Antoinette Robinson) visits Baker Street and identifies herself as Moriarty’s daughter, stunning Holmes, who had no idea about his nemesis’s progeny. 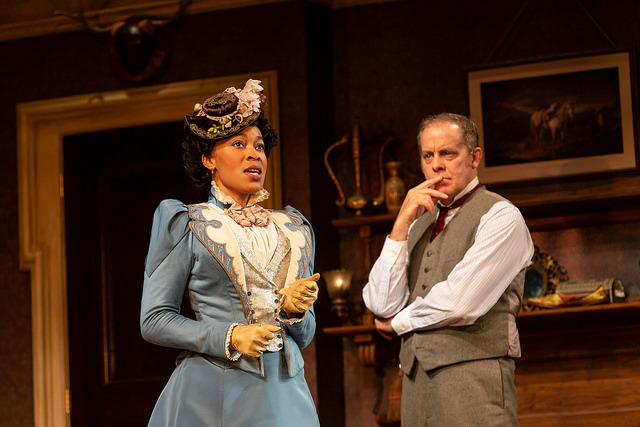 Holmes is enamored of his new acquaintance, who tells the detective her wish is to broker peace by leading Holmes to her brother who is threatening Holmes, and allow Holmes to use his powers of persuasion to remove the threat. Watson is concerned, and soon Scotland Yard is involved in the person of Malcolm Ingram’s Inspector Lestrade, a clueless operative at his bumbling best, yet another foil for the acid-tongued Holmes. That is about as far as we can go before bumping into one of the numerous switchbacks, curveballs and red herrings scattered along the way. 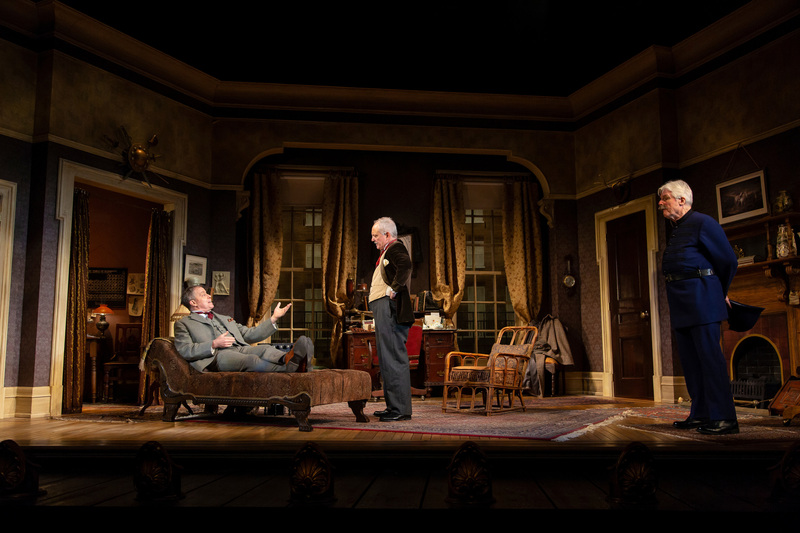 Set designer Hugh Landwehr’s’s rendition of the famed 221B Baker St. flat is comfortable, impressively detailed and worthy of the ovation it received as the curtain rose at a recent performance. When the plot brings the characters to a dark, dangerous warehouse, Philip S. Rosenberg’s lighting is especially effective, and Mic Pool’s sound design also helps set the scene when events get tense. Director Maria Aitken is a familiar and welcome presence on Huntington Avenue, and she is a deft hand at both the comedy and suspense of this type of piece, a close cousin to her hit production of “The 39 Steps,” which transferred from the Huntington to Broadway. “Sherlock’s Last Case” is pure entertainment, winningly presented and performed. The Huntington Theatre Company production of Charles Marowitz’s “Sherlock’s Last Case.” Directed vt Maria Aitken. Scenic design by High Landwehr. Costune design by Fabio Toblini. Lighting design by Philip S. Rosenberg. Sound design by Mic Pool. At the Huntington Avenue Theatre through Oct. 28. Huntingtontheatre.org.